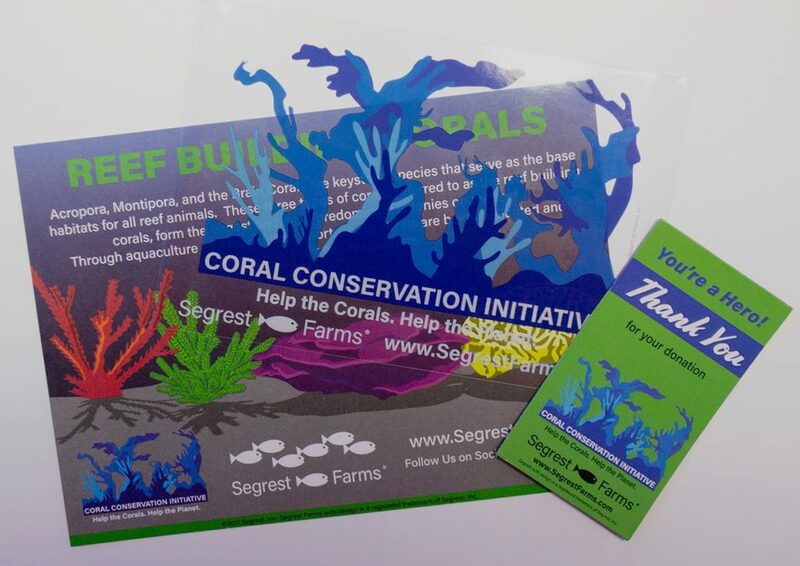 Get a free colorful postcard, a window cling and a fridge magnet, when you give to one of the coral conservation organizations showcased in Segrest Farm’s new Coral Conservation Initiative (CCI) Database. To help promote coral conservation, Segrest Farms Coral Conservation Initiative is collaborating with Zoos and Aquariums to help spread the knowledge of maricultured, aquacultured, and sustainably-collected corals. Along with that, we are connecting hobbyists directly with coral conservation organizations from around the globe. Go to the Segrest Farms Coral Conservation Initiative Database to help these organizations maintain the worlds coral reefs and those local economies that rely on the coral reefs. For your donation you will receive a Thank You packet directly from Segrest Farms. After you donate all you have to do is fill out the linked google form (link located at top of the page). The Thank You packet consists of a colorful postcard, a window cling and a fridge magnet.